No points for deducing the theme of this week’s Boston Symphony Orchestra concerts with guest conductor Gustavo Dudamel. Robert Schumann gave his First Symphony, in B-flat Major, the subtitle “Frühlingssymphonie,” or “Spring Symphony,” and Igor Stravinsky’s Le sacre du printemps — The Rite of Spring — speaks for itself. On Saturday, temperatures were spring-like, and Dudamel, making his BSO subscription-series debut with this relatively short program, gave a pair of heavyweight interpretations in one of the best Symphony Hall evenings I can remember. Schumann drafted his First Symphony in just four days in January of 1841. His wife, Clara, wrote in their Household Book that he was inspired by Adolf Böttger’s “Frühlingsgedicht” (“Spring Poem”), in which the dreary spirit of clouds and mist that blots out the star of love and shadows the light of the poet’s soul is enjoined to depart, for “in the valley spring is blooming.” Schumann himself wrote to fellow composer Louis Spohr: “I composed this symphony at the end of winter, with that springtime élan that returns every year, right into old age. I did not attempt to depict or describe anything, but the season in which it was born did, I am sure, affect the shape it took and help to make it what it is.” He even provided the four movements with titles (though he later removed them): “Frühlingsbeginn” (“The Arrival of Spring”), “Abend” (“Evening”), “Frohe Gespielen” (“Merry Playmates”), and “Voller Frühling” (“Spring at the Full”). The motto, in any case, isn’t just a motto — speeded up, it’s the movement’s first theme. Spring arrives with buds opening, butterflies fluttering, birds wooing, just about everything but the proverbial cuckoo. The development climaxes with a triumphant display, and then the recapitulation is off again, getting faster and faster until it opens up into a new theme, Schumann playing his usual tricks with form. It’s a kind of benediction before the brass hurtle the movement out. The 3/8 Larghetto, in E-flat, is a sober evensong. (Jean-Luc Godard used it as the closing theme in his politically very sober 1966 film Made in U.S.A.) Like the slow movement of Beethoven’s Ninth, it grows uneasy toward the end as it transitions directly into the Scherzo. This movement, marked Molto vivace,has not one but two Trios, the first in 2/4 and marked “Molto piú vivace,” the second in the main 3/4 meter with no new tempo marking. Like the opening movement, it ends with a new thought. The finale, Allegro animato e grazioso, begins with a fanfare and proceeds to a bustling 2/2 dance before the second theme provides a mischievous disruption by quoting from the eighth and last section of the composer’s 1838 piano work Kreisleriana. The development brings another surprise, a flute cadenza, and then Schumann builds to a climax that marks, as he described it, not just “Spring at the Full” but “Farewell to Spring,” the season’s last fling before the lull of summer. Some 50 years ago, Donald Francis Tovey wrote that “No orchestra ever earned its reputation by its interpretation of Schumann.” As Schumann told Spohr, “You will not find it too easy, but neither will you find it too difficult.” What can be difficult is Schumann’s orchestration, which attempts, with moderate success, to reproduce the sensibility of his early-Romantic piano compositions. Getting the balance right can be particularly problematic. Felix Mendelssohn led the First’s 1841 premiere with a Leipzig Gewandhaus contingent that numbered about 45. Modern orchestras have more strings than that. Dudamel’s BSO included what looked like at least 45 strings, but if there were balance problems, I didn’t detect them. And his interpretation was everything a Schumann First should be: earthy, lusty, cheeky, and conveying the composer’s sly moments. The motto fanfare was weighted, almost martial, and the D-minor chord shuddered, as if winter were indeed being shown the door. The introduction was buoyant and expectant, Dudamel practically airborne, conducting without a score and fully focused on the orchestra. The “Allegro molto vivace” first theme really accelerated, spring coming in like a lion, with big brass and timpani accents; then he set off the second theme with a subtle ritardando and a lighter approach. The development had sweep, not to mention sinuous winds; it climaxed in a relaxed repeat of the motto fanfare, as if the movement had reached its climax — but then the first theme raced away again to start the recapitulation. Conductors tend to slow for the benediction, even though Schumann doesn’t ask them to. Dudamel took this section in tempo; it sounded quite natural and led to a majestic conclusion. The Larghetto has a metronome mark of 66 eighth notes to the minute; at a steady tempo, that would yield a six-minute movement. Dudamel took some seven minutes in a reading that lingered and felt heavy, a more sober depiction of evening than I think Schumann intended, though it was moving on its own terms. The transition to the Scherzo was portentous, and the Scherzo itself was rustic and jolly. 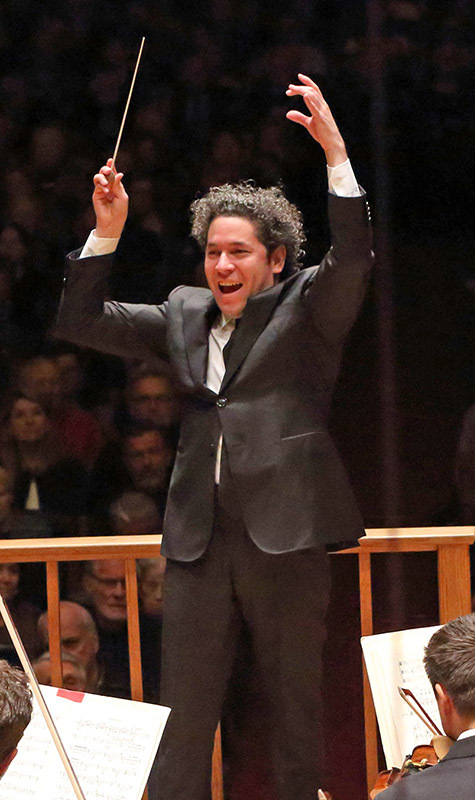 Dudamel’s solution to the tempo problem of the second Trio was to treat it like the first Trio rather than taking it at the movement’s main tempo. This isn’t what Schumann marked, but it’s what I think he must have meant. Dudamel’s tender treatment of the Scherzo’s end allowed the celebratory fanfare that opens the finale to catch you off guard. The first theme here bustled cheerfully, and the Kreisleriana-derived second, which can slide by unnoticed, was teased out so it could have its proper impact. This was a full-throated reading with ample dynamic contrast, ample timpani, a lovely flute solo from Elizabeth Ostling, and a circusy cancan finish. Schumann may have told Spohr he wouldn’t find the symphony “too difficult,” but Dudamel, intense throughout and bouncing on his toes in the upbeat sections, made conducting it seem easy in what was a big, heroic interpretation. No one has ever been told that he or she wouldn’t find Sacre “too difficult.” The piece, which caused a riot at its 1913 Paris premiere, was like no music that had been ever heard: polytonal, polymetric, polysemic, poly-everything. It had titles in three different languages; Stravinsky thought the Russian version, Vesna svyashschennaya (“Sacred Spring”), was the closest to his intention. Conceived as a ballet score for Serge Diaghilev’s Ballets Russes, it developed a wealth of conflicting origin stories, many of them emanating from Stravinsky. The composer was also responsible for the many versions of the score, and for changes in tempo markings over the years. (So Sacre has that in common with the Schumann First.) Stravinsky was adamant about how Sacre should be performed, and to that end he made a piano roll and three recordings — all quite different. Over the past 106 years, the piece has just kept getting bigger and more elusive. One thing we can be sure of is that the riot at the premiere was occasioned as much by Nikolai Roerich’s costumes and Vaslav Nijinsky’s choreography as by Stravinsky’s score. To be sure, there were what Stravinsky called “mild protests” during the Introduction to Part I. But it wasn’t till the curtain opened on what Stravinsky later described as “knock-kneed and long-braided Lolitas jumping up and down” that the audience got out of hand. A century later, the choreography, as reconstructed by Millicent Hodson, seems every bit as radical as the score. Yet nothing like Sacre has been heard since. It’s a Babel of meters, rhythms, and languages (diatonic, octatonic, modal, dissonant) from which a conductor has to create an architecture and tell a story. And despite Stravinsky’s subsequent attempts to distance himself from the premiere by claiming that the music preceded the scenario, it seems clear that the music was always about the scenario, that in fact Roerich and Stravinsky had worked out the scenario in advance of the music. Well before the premiere, Stravinsky was writing about the swarm of dudki (spring pipes) that suffuse the Introduction, about the khorovod (circle dance) games for the adolescents. When the Sage arrives and kisses the earth, spring breaks out in orgiastic dance. That’s Part I, or day, of Sacre. Part II is night: the maidens have their own games on the sacred hill, and one is chosen for ritual marriage to the Slavic sun/spring god Yarilo, both in gratitude for the spring that has arrived and to ensure that it will return. After her glorification, the bearskin-clad Ancestors arrive, and she dances herself to death. Stravinsky participated in the creation of the choreography as well; one can see from Hodson’s reconstruction book Nijinsky’s Crime Against Grace and the Mariinsky Ballet DVD of her reconstruction just how closely the music and the steps fit. We’re used to hearing Sacre as a concert piece, but from the beginning it was a ballet. Yet recordings and performances have gradually lost the picture; over the past century, they’ve become harsher, more mechanized, more modern, as if Stravinsky’s inspiration had been not pagan Russia but Futurism. There was nothing mechanized about Dudamel’s interpretation. There was nothing terribly original or mannered about it, either, but as with the Schumann, he made delivering a great performance look natural. It ran some 35 to 36 minutes, which is at the long end of the Sacre tempo spectrum, and yet he generated tremendous momentum at the end of both Part I and Part II. The slow sections were atmospheric without dragging; the fast sections were exhilarating rather than driven. The reading had an architecture, it told a story, and it conveyed the choreography in a way that few interpretations do. The terrifyingly high bassoon solo that opens Sacre is marked “ad lib.,” and Dudamel, still with no score, stood quietly as Richard Svoboda, in total control of his phrasing, made it the spooky cry of a wild animal. The French horn and the clarinets that sound alongside the bassoon in the first four bars weren’t mushed into the bassoon’s texture but had independent life. The “piú mosso” middle section of Part I’s Introduction wasn’t appreciably faster — it almost never is — but it had energy, the winds (with a line-up including alto flute, piccolo clarinet, bass clarinet, and English horn) chattering away like the winds at the outset of the Schumann, the tempo measured but not slack, every instrument ripe yet dry and discrete, a pellucid cacophony. When the solo bassoon broke in to mark the end of the “piú mosso,” the tempo didn’t slow but everything changed, just as it should. This Sacre was thoroughly thought out. “Spring Divinations/Dance of the Maidens,” which tends to be either slow and heavy or quick and lightweight, was both quick and heavy, the trumpets underlining that point in the scenario where the 300-year-old woman with divining twigs leaps about. Big with brass and timpani, the movement made a huge sound without ever clotting. “Spring Rounds” — here faster, to my ear, than Dudamel was in his 2010 Deutsche Grammophon recording with the Simón Bolívar Youth Orchestra of Venezuela — was built along the same lines, weighty but not weary. The “Vivo” irruption raced; the ensuing “Tranquillo” wound down with an unmarked ritardando that set up the eruption of the “Games of the Rival Tribes.” The “Procession of the Sage” was shocking in its brutality, and after the almost silent mystery of the four-bar “Adoration of the Earth,” the “Dance of the Earth” exploded with dizzying, awesome speed and no loss of clarity. The Introduction to Part II was relatively modest, the tempo moderate (some, like Bernstein in his 1958 New York Philharmonic recording, have dared to go at the Largo marking), the big shudders (admittedly marked mezzoforte) not very suspenseful. But the transition to the “Mysterious Circles of the Maidens” was well marked, as were the two points at which one maiden slips, fate singling her out to be the Chosen One. The tension ratcheted up immediately; the pounding 11/4 bar was nightmarish and in tempo, and that was also true of the fanfare that opens the “Evocation of the Ancestors.” The following “Ritual Action of the Ancestors,” with its opening burble for English horn and alto flute and deadpan rhythm, often flags — Stravinsky appears to have intended this music to be the final dance of death and then realized it was too tame. Dudamel kept the tempo up and created a sense of anticipation that the concluding bass-clarinet burble only heightened. The closing “Sacrificial Dance” has always been problematic. You get some idea of the initial concept from Pierre Monteux’s 1929 recording with the Orchestre Symphonique de Paris. At this speed the finale was subsequently judged unplayable, but the printed score’s tame quarter note = 126 yields an anticlimactic result. Dudamel went back to the spirit of the original, differentiating the movement’s subsections, bringing out the “Dies Irae” line, and blazing home with only a hint of congestion. The separation of the anacrusis from the final chord was big but in keeping with the interpretation. “Wow” is said to have been Stravinsky’s reaction to Bernstein’s NYPO interpretation. This too was a “Wow” performance, and possibly with more accurate execution from the orchestra. Gustavo Dudamel and the BSO will repeat this program Tuesday April 9 at 8 p.m.
Gustavo Dudamel has withdrawn from his remaining Boston Symphony concerts. The culprit is a hand injury sustained in December. Ken-David Masur takes over the final Schumann / Stravinsky program on Tuesday, while James Burton takes the second set of concerts, of which only Estevez’s Cantata Corolla remains from the original program. Replacement pieces include Ravel Concerto & Berlioz Roman Carnival Overture. Excellently detailed review of a superb concert. Dudamel will be conducting “Rite” again next season at Symphony Hall as part of the Celebrity Series, with the L.A. Philharmonic. I wonder how (and if) it will be different. James Burton will not be conducting Ravel and Berlioz. Ken-David Masur will be on the podium for those works. This is everything a review should be, full of interesting insights into both the program and the performance, enriched with interesting asides and witty remarks from Donald Tovey, but always about the music. I will be there tonight, though unfortunately Dudamel won’t; it will be interesting to see how well this review describes tonight’s performance under Masur. It was a pleasure to see that Dudamel divided the violins left and right, and to hear that he observed the repeats in the Spring Symphony. Would that we had more of that. Gantz is right to mention the orchestra — they played superbly! Tuesday night Masur was terrific. The Schumann was fresh and a thorough delight, the Stravinsky was dynamic and terrifying, every detail brought out, nothing glossed over, powerful in its inexorable cruelty. Was it Masur conducting an independent interpretation of his own, or was it the orchestra playing Dudamel’s conception after already playing it three times earlier in the week? If you didn’t catch Dudamel, he should be rebroadcast this coming Monday on WCRB at 8 p.m. Perhaps you might tell us the difference, if any? I’m particularly curious about the anacrusis before the final chord (mentioned by Jeffrey Gantz in his review). Under Dudamel the unexpected pause between it and the final chord was absolutely shocking, chilling, unnerving. I was relieved that no one started to applaud before that final chord. Alan – I expect to find out tomorrow night, when it’s a different program (mostly). I had exactly the same question myself about whose interpretation we were hearing. Masur certainly led the orchestra actively in both works, but the pause and final chord at the end of the Stravinsky was exactly as Gantz described; overall both works sounded much the way he described. So, it’s hard to tell. I suspect that they were playing as Dudamel had prepared them, but with some refinement due to Masur. Thank you so much, Leon, for that clear and speedy response! It’s nice to think that what’s left of winter is Rite of Spring. Even the NEC Philharmoia is doing it on April7th (free) at Jordan Hall, and Dudamel will conduct it with the L.A.Philharmonic on Nov. 23rd at Symphony Hall. No such thing as “too much” for this work! Sorry for the typo. The “Rite” at NEC is on April 17th. Like Leon Golub, I really enjoyed last Tuesday’s Schumann and Stravinsky concert with Ken-David Masur. Both the players and the audience deeply appreciated his ability to step in on short notice to lead such bracing performances, which were empowered significantly by his razor-sharp conducting style and unambiguous beat. I had the sense that neither he nor the orchestra had had either the time or inclination to veer too sharply from the earlier approaches. Having said that, I’ll add that the re-broadcast of the same program with Gustavo Dudamel on the podium was truly special. By Saturday night the band had aligned so completely with the ‘Spring’ Symphony that it unfolded as from a single, beautiful mind – it made me wish that Robert Schumann had had the chance to hear such an exalted rendition. As for The Rite: like spring itself, Le Sacre never gets old, and often stokes new passions and inspirations. Dudamel’s were magnificent: the Saturday night Rite was brilliant, not only for its thrilling tempi and the sheer force of its violence, but for the orchestra’s clarity and technical precision that made it all possible and audible. In regard to Alan Levitan’s question, my sense is that the Dude-led final chord was slightly more, well, concordant than the one that concluded Tuesday night’s Rite, but both came after unusually protracted separations, and simply stunned. Thank you for that, Nimitta. I heard the Saturday night broadcast on the radio and agree with you completely on the “magnificent passions and inspirations” of Dudamel in both the Schumann and the Stravinsky. Glad to hear that Masur’s pause-plus-chord at the end was also a stunner on Tuesday.